The 20-track album titled OPM Number 1's combines music from ABS-CBN shows and Star Cinema movies. Some of the country's biggest artists in the music industry joined forces for one album as they sing the top hits of OPM. Produced by Star Records, this compilation album is titled OPM Number 1's. Twenty tracks from Primetime Bida shows, Star Cinema movie theme songs and other well-loved hits are included in the album. These include Mr. Pure Energy Gary Valenciano's version of the teleserye theme song "Tayong Dalawa" and Kyle Balili's rendition of the theme song of "May Bukas Pa." Sarah Geronimo's version of "You Changed My Life in a Moment" was used as theme song of the blockbuster hit where she was paired with matinee idol John Lloyd Cruz. "Himig ng Pag-ibig" by Yeng Constantino and "Ikaw Ang Pangarap" by Martin Nievera were used as the theme songs of the shows Dyosa and Lobo, respectively. Not to be missed are songs performed by Charice Pempengco, Yeng Constantino, Piolo Pascual, and KC Concepcion, among others. 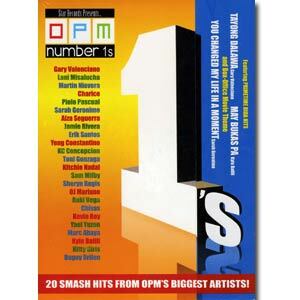 Grab your own copy of OPM Number 1's to hear various artists perform their hits. This 20-track album is available in record bars nationwide produced by Star Records.